Dev, are available for all supported versions of Windows 10, with more platforms coming soon. “That is especially true since Microsoft is disabling many of the functions integrated with Google apps and tools,” he told LinuxInsider. Microsoft’s decision to adopt the Chromium open source project in the development of its new Edge browser on the desktop is a logical step in the company’s efforts to become more embedded with open source technology. The Edge browser has been struggling. The new development road map is based on a microservices/componentized approach, according to the company. Microsoft’s goal is to create better Web compatibility for its customers. It also aims to reduce fragmentation of the Web for all Web developers. Rebuilding the Edge browser around Chromium reinforces Microsoft’s commitment to open source. Its software engineers have started making contributions back to Chromium in areas involving accessibility, touch and ARM64. It’s not likely that Microsoft’s increased involvement with open source will give the company any competitive edge, King observed. “I expect them to function much as any contributor. It’s less of an issue today than it would be if Steve Ballmer were still Microsoft’s CEO,” he said. Microsoft was faced with one of those “if you can’t beat them, join them” situations, according to King. That might have figured into the Chromium decision. “As a technology comes to dominate online functions and interactions, developers focus on optimizing sites and apps for it. To ensure that customers have optimum online experiences, vendors adopt those dominant technologies,” he pointed out. “Sites that are not optimized for dominant tech also tend to perform relatively poorly compared to those that are. That results in a two-tier Web of sorts, which is one of the reasons Mozilla developed Firefox,” he said. There is no downside to Microsoft switching to the Chromium platform in Swann’s view. Computer coding is a part of everything and is everywhere in the world around us. Scientific and technological innovation are cornerstones of our global economic system. Our economy, our well-being… everything depends on it. It is not just important in technology-related fields. Coding is vital in manufacturing, healthcare, farming… virtually any industry has a coding component. The question that remains should not be “why?” but “how?” How can I inspire my child to learn to code, when should I start, and what are the many benefits? Coding is easier than you may think! Coding is extremely easy for children to grasp and thus, after a brief introduction and some exploration, rudimentary skills can be mastered. This basic knowledge helps children interact with the technology around them versus passively consuming it. Through this quick mastery, they build their self-confidence. As children become more confident, it encourages them to press further in their coding education and learn more. The reality is technology is going to evolve at lightning speed in the future, but the set of skills a child develops from learning to code will be there for a lifetime. Children develop creativity by experimenting and making mistakes. They learn through coding education that there is more than one way to do something. Just keep trying! One of my favorite quotes is from Margaret Meade: “Children must be taught how to think, not what to think.” Coding teaches children how to think! Learning a new language teaches children another way to communicate. It is exciting it for a child to learn how to communicate more directly with technology around them. As with learning any language, children should be exposed to coding at an early age. Coding teaches logical thinking and strengthens both written and verbal skills. Children who learn to code better understand how to organize their thoughts. Coding is a language skill that opens the world to children. Learning to code helps children visualize abstract concepts. Through coding, children learn how to apply mathematics to real world issues and formulate creative solutions. Coding makes math more practical, appealing and fun! In creative environments there are no right answers and no guidebooks. Through the discipline of coding, children seek validation from their peers and tend to work in groups. They learn to collaborate, to give and receive criticism in a positive way, and to incorporate feedback in what they are doing. The development of these skills is extremely important in their later lives and careers, as is the understanding that there are many solutions for the same problem. Children learn through coding that knowing how to ask the right questions is sometimes more important than having the right answers. My biggest inspiration in everything I do is my son. He is fascinated with science and technology and can’t help himself from constantly asking “how does this work?” about almost everything around him. As an innovator in the tech space, I want to enable a new generation to feel empowered by technology and feel comfortable in being proactive with it, rather than being beholden to it and consuming it passively. Learning to code is critically important in this process. As a parent, I plan to encourage my child to learn to code and continue to evolve and expand his skills as long as possible, and encourage him not to give in to any moments of discouragement. I want him to push beyond his limits as often as he can and reap the corresponding benefits. For parents looking to increase their children’s exposure to coding, I have personally found that great programs are available at local libraries, museums, summer camps and learning centers to supplement what children are exposed to in school. A variety of STEM-related products are available as well. I also believe that coding education and its importance must be understood by the educator. Educators know that making math and science both fun and interesting helps students do much more than just learn. Learning through play and “by doing” is critical — it is entertaining and educational. Coding education should be tailored to a student’s abilities and educational level as well. This type of modification and evolution of subject matter by educators is critical in the learning process. Almost every job in the future will require basic understanding of math and science and software. As an employer, however, I still find it challenging to fill coding-related jobs. I am here to tell you that aside from being lucrative, jobs that require coding are both interesting and readily available! Although coding education has the potential to break the traditional gender roles, there is still an under-representation of women and minorities in related fields. Because of my personal experiences, it is of great importance for me to promote diversity and inclusion in the workplace. I have made it my personal mission to hire and cultivate women in technology. I encourage both parents and educators to help me in this mission by insisting upon and supporting coding education for all children worldwide, especially for girls and minorities. For those who try to keep their finger on the Linux community’s pulse, 2018 was a surprisingly eventful year. Spread over the last 12 months, we’ve seen various projects in the Linux ecosystem make great strides, as well as suffer their share of stumbles. All told, the year wrapped up leaving plenty to be optimistic about in the year to come, but there is much more on which we can only speculate. In the interest of offering the clearest lens for a peek into Linux in 2019, here’s a look back at the year gone by for all things Linux. The last ripples from 2017 into 2018 came from Ubuntu’s decision to phase out the Unity desktop and switch its flagship desktop environment to Gnome. Ubuntu’s first image to ship with Gnome was with its October 2017 release of 17.10, but it was something of a trial run. With April’s 18.04, Ubuntu officially unveiled its first Long Term Support (LTS) track to feature Gnome 3. With an LTS sporting Gnome and holding up to user testing, the countdown clock began on the eventual switch to the Wayland display server, intended to take over for the aging Xorg server. Think of display servers as the skeletal beams that a desktop is bolted to. Ubuntu 17.10 tested Wayland waters, but although 18.04 shied away from Wayland, the fact that 18.04 seems to have Gnome under control means the Ubuntu flagship desktop developers can turn their attention to Wayland, hopefully catalyzing its evolution. Many saw the end of Unity not so much as an admission of defeat in cementing Ubuntu’s own desktop vision, but as evidence of a pivot in Canonical’s focus to cloud computing and IoT. After months in the wild and the update to Ubuntu’s incremental patch, 18.04.1, it is clear by this point that the decision to abandon Unity did not so much as jostle the stability of Ubuntu’s release. In fact, 18.04 has proven exceptionally stable, polished and well-received. Few are the distributions that can put out as robust and distinct a product as Ubuntu, while also maintaining their own desktop. The only one that might lay claim to this is Linux Mint, but its code base has far fewer deviations from Ubuntu than Ubuntu’s has from Debian. Put another way, Mint’s code base is similar enough to Ubuntu’s (Mint’s upstream) that it can afford to dedicate time and resources to in-house desktops. Without its own desktop, Ubuntu doesn’t seem worse for wear, but as refined and dependable as ever, especially with the introduction of features like a minimal install option and restart-less kernel updates. It will be hard to tell how the end of Unity ultimately will impact Ubuntu until its next LTS drops in April 2020 — but for now, Ubuntu fans can breathe a sigh of relief as the distribution continues to shine. beta testing support for running Windows games on Linux. Steam evidently has been playing the long game (no pun intended) in backing work on the Windows compatibility program Wine, as well as the DirectX translation apparatus Vulkan, over the past couple of years. This past summer, we saw these efforts coalesce. In a framework called “Proton,” Steam has bundled these two initiatives natively in the Steam Play client. This enables anyone running a Linux installation of Steam Play (who is enrolled in the beta test) to simply download and play a number of Windows games with no further configuration necessary. A marked lack of access to top-tier games long has been a sticking point for Linux-curious Windows users considering a switch, so Steam’s ambitious embarkation on this project may prove to be the last encouragement this crowd needs to take the penguin plunge. Steam has been exercising patience, as it has been maintaining a periodically updated list of the number and degree of Linux-compatible Windows games in its library of titles. It hasn’t been afraid to acknowledge that a number of Windows games still need work, another sign of sober expectations on the part of Valve. Taken together, these steps suggest that Steam is in this for the long haul, rather than throwing together a quick fix to increase revenue from Linux-bound customers. If that weren’t proof enough, Steam even has gone so far as to post the code for Proton on GitHub, which is as good a sign as any that it is invested in the Linux community. The entire undertaking holds promise to steadily improve the Linux desktop experience as more games reach mature compatibility, and Proton slowly crawls out of beta. Although the Linux desktop landscape saw modest but undeniable progress, there was much more at play in the enterprise Linux arena. Perhaps the single biggest Linux headline this year was IBM’s acquisition of Red Hat. IBM and Red Hat have enjoyed a long and fruitful partnership, and IBM’s shrewd tactic in competing with Microsoft more than a decade ago played the leading role in Red Hat’s rise in the first place. Red Hat popularized, if not pioneered, the practice of selling support and tailored configuration as an open source business model. Fatefully for Red Hat, IBM was the big ticket customer that supercharged its revenue stream and confirmed the profitability of premium support. IBM minted its alliance with Red Hat because it wanted to compete with Microsoft in the server market without having to license an expensive operating system. In some ways, IBM’s outright purchase of Red Hat may have been inevitable. The two have grown symbiotically for so long that subsuming Red Hat into IBM likely was the only way to squeeze more efficiency and return on investment out of the relationship. You could even liken it to a couple who’ve been together for years finally announcing their engagement. Whatever else Red Hat’s purchase signifies, it legitimates Linux as an enterprise powerhouse, and lends credence to open source developers who long have touted the profitability of their work. Amid all the deserved fanfare surrounding this betrothal, little attention has been paid to the reverberations it will send through the bedrock of the entire Linux space. Red Hat spearheads development of systemd, a replacement for the System V Linux init process that already has seen significant adoption among Linux distributions. This is no meager contribution, as the init system is the single most central component of the operating system after the kernel, and it dictates how the OS finishes booting. Thus, the question on the minds of those who are giving this matter serious consideration is this: How will entrusting a (now) corporate-owned company to build the init process implemented in the vast majority of Linux distributions impact the course of Linux’s development? This leads perfectly into the next big story from the past year, because it demonstrates both the weight of the responsibility bestowed upon Red Hat in writing an industry standard init system, and the potential for harm, should this responsibility not be approached with proper humility and care. execute arbitrary “systemctl” commands without authenticating, granting what amounted to full root access to that UID. The bug in question isn’t in systemd per se, but it pertains to systemd, in that systemd implicitly trusts the program containing the bug, polkit. So, because implicit trust itself is an unwise software development practice, to say the least, it equates to a bug in systemd, in some ways. When systemd first took hold in the Linux biome, there was more than a little griping in the community. The central issue was that systemd contradicted the Unix philosophy by constructing and relying upon such a monolithic program (moreso than init intrinsically is). To give a sense for how truly behemoth systemd is, it has swelled beyond the bounds of init’s reasonable purview to encompass DNS server IP assignment and regular task scheduling, relegating such venerable Unix stalwarts as /etc/resolv.conf and cron to (eventual) obsolescence. It seems that these Unix philosophers may have had a compelling, but ultimately unheeded, point. Microsoft joined the Open Invention Network (OIN), subsequently open-sourcing more than 60,000 patented pieces of its software. The OIN is a coalition of partners committed to insulating Linux and Linux-based projects from patent lawsuits. To that end, all members not only are obligated to openly offer patented software for public use, but also are allowed to freely license patents from one another. Aside from the benefits this obviously confers on Microsoft, especially with companies like Google for fellow members, it puts another power player squarely in Linux’s corner. This may be the final sign of good faith the Linux community needed that Microsoft sincerely has embraced Linux and, moreover, that it has substantial plans for Linux-related projects in its future plans. Open Source and Open Silicon? line of high-end Linux desktops featuring open hardware specifications. The Thelio line boasts an elegant, premium look that is sure to lure more than the privacy-conscious. Open hardware is the hardware analog to open source software, and while it has been an aim of the security-conscious and freedom-loving tech denizens, it has subsisted as little more than a pipe dream until recently. The quest for open hardware arguably was accelerated by the Snowden disclosures, and the extent to which they revealed that hardware OEMs may not entirely deserve users’ trust. Purism was the first consumer-oriented company to take up the charge but, as it will admit, its product is a work in progress, and not as open as the company and its privacy crusader allies envision. Bringing more open hardware options to consumers, and thereby injecting competition into an otherwise sparse field, is an unalloyed good. While reviews of the year’s events certainly are interesting, if just for a sense of scope, retrospectives aren’t particularly useful unless they are applied. With all of these 2018 milestones in mind, what trajectory do they suggest for 2019? Last year easily was one of the best years for the Linux desktop sphere since I started using Linux (which admittedly wasn’t very long ago). Alongside big news from Steam and a reassuringly strong LTS release from Ubuntu, came piecemeal strides by distros like Elementary and Solus in solidifying their work and their reputations as just-works, mass-appeal desktop systems. Along with the production of first-class hardware like System76’s Thelio PCs, and even Manjaro’s Bladebook, desktop Linux has never looked better. high-profile publications giving Linux an open mind and a positive reception, so it wouldn’t be a far-fetched scenario for Linux to see an uptick in first-time users. The enterprise realm is set to be much more tumultuous, as IBM and Microsoft have planted their respective flags in different corners of the Linux world. This could precipitate a wave of innovation in Linux as established corporate powers poise themselves for cloud supremacy. On the other hand, this cloud computing contest could lead development of Linux and its satellite projects down a path that is increasingly dissonant — not just with Unix philosophy, but with the free software or open source ethos as well. I took a detailed first look at this new distro in February 2015, primarily to assess the Trinity desktop (TDE). That was a version 1 beta release. Still, Trinity showed some potential. I have used it on numerous old and new computers, mostly because of its stability and ease of use. Every few upgrades I check out its progress. Key to this is watching the improvements and additional functionality of Trinity. Q4OS is a lightweight Linux distro that offers some worthwhile alternatives to more established distros. Do not misunderstand what “lightweight” in Linux means, however. Q4OS is designed with aging computer hardware in mind, but it does not ignore more modern boxes. Trinity project desktop. Trinity was forked in 2008 from the last official release of the K Desktop Environment’s third series (KDE 3), version 3.5.10. Q4OS has a simplified KDE 3 design that has useful desktop applets for this alternative to the Trinity desktop. Other desktop options also are built in. The Germany-based developers recently issued a significant update to the Q4OS snapshot of the distribution’s Testing branch, code-named “Centaurus.” Q4OS Centaurus 3.4 is based on the current Debian “Buster” and Trinity desktop (TDE) 14.0.6 development branches. This distro is fast and runs extremely well on low-powered aging computers. Q4OS has superb performance on newer computers. Its design pushes classic style with a modern user interface in a new direction. Plus, it is very applicable for virtualization and cloud use. When I first started to monitor the Trinity desktop, I thought it had the potential for becoming a new attention-getter among up-and-coming Linux distros. The primary distro developer that implemented TDE was, and still is, Q4OS. The distro primarily is built around TDE as the default desktop. It is easy to swap TDE into other more popular desktops without removing an easy return path to both TDE and KDE. Supported desktops include LXQT, LXDE, XFCE4, Cinnamon, KDE Plasma, Mate and GNOME. Installing a different desktop does not remove the TDE desktop. Instead, you can select between the alternative you installed and the TDE desktop at the login screen. To install a different desktop environment, go to the Desktop Profiler tool and click the Desktop environments drop-down in the upper right corner of the window. A new window appears, where you can select your desktop of choice from the drop-down. Once back at the main Profiler Window, select which type of desktop profile you want, and then click Install. These choices give both business and individual users lots of options. One of the big values in using Q4OS Linux is the add-on commercial support for customizing the distro to meet specific user needs. The name of the developers is not publicized on the website. However, Q4OS clearly is intended to be more than a community-supported general purpose Linux distro. The website also invites businesses to makes use of Q4OS.org’s commercial support and software customization services. Q4OS is designed to offer a classic-style user interface (Trinity) or other alternatives with simple accessories. The distro provides stable APIs for complex third-party applications, such as Google Chrome, VirtualBox and development tools. The system also is ideal for virtual cloud environments, due to its very low hardware requirements. One of the most important changes in this latest release is the switch to the Calamares installer. Calamares offers nice new installation features. For example, it offers optional full encryption of the target system, as well as easy disk drive partitioning. Another important change is a move to the new Trinity 14.0.6 development version. All dependencies from the current stable Q4OS Scorpion version have been removed, making Centaurus fully independent, with its own repositories and dependencies. Secure Boot support has been improved too. This is very handy if you install Q4OS on newer hardware hosting Microsoft Windows. The Calamares installer detects if Secure Boot is active and adjusts the target system accordingly. If Secure Boot is switched off in the firmware, no Secure Boot files are installed. Q4OS Centaurus offers the bleeding edge of Linux computing. It will be in development until Debian Buster becomes stable. Centaurus will be supported at least five years from the official release date. The minimal hardware requirements are ideal for older hardware. The Trinity desktop needs at least a 300-MHz CPU with 128 MB RAM and 3 GB hard disk storage. Most of the other alternative desktops are lightweight and run with ease under the minimum resource requirements. The KDE Plasma desktop — and perhaps the Cinnamon desktop — thrive with at least a 1-GHz CPU, plus 1 GB RAM and 5 GB hard disk storage. The TDE project began as a continuation of the K Desktop Environment (KDE) version 3 after the Kubuntu developers switched to KDE Plasma 4. The name “Trinity” reflects that heritage. It means “three,” and TDE was a continuation of KDE 3. The Trinity desktop design presents the simplified look of KDE applications while eliminating the layers of customization associated with KDE’s Activities and virtual desktop navigation. It displays the Bourbon start menu and taskbar. 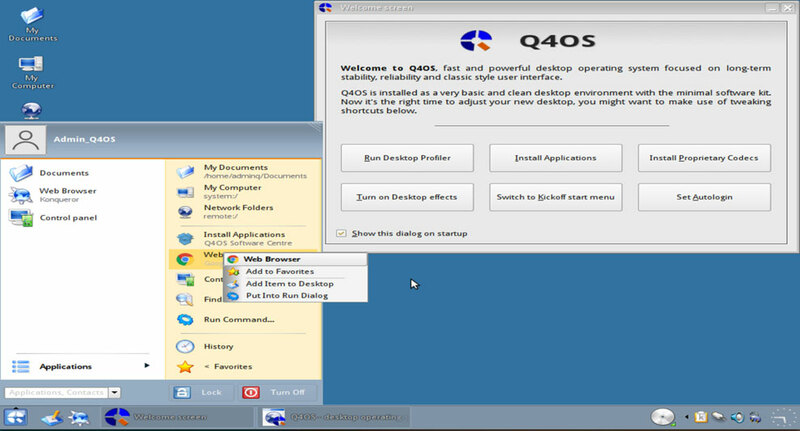 Q4OS’s Trinity environment has a simplified desktop with bottom bar, classic menu options, and the ability to add/remove application icons on the desktop. Timothy Pearson founded the TDE project and continues to lead it. He is an experienced software developer who was the KDE 3.x coordinator of previous Kubuntu releases. TDE is both flexible and highly customizable. It has a pleasant visual appeal. Its desktop effects are compatible with older hardware. Trinity fills the gap left open with the other lightweight desktop options, which offer little in the way of desktop visual effects. The field of new alternative desktop environments has created a clutter that may have blunted more interest in TDE. For instance, choices such as Pantheon, Enlightenment, Budgie and Awesome offer unique lightweight choices. 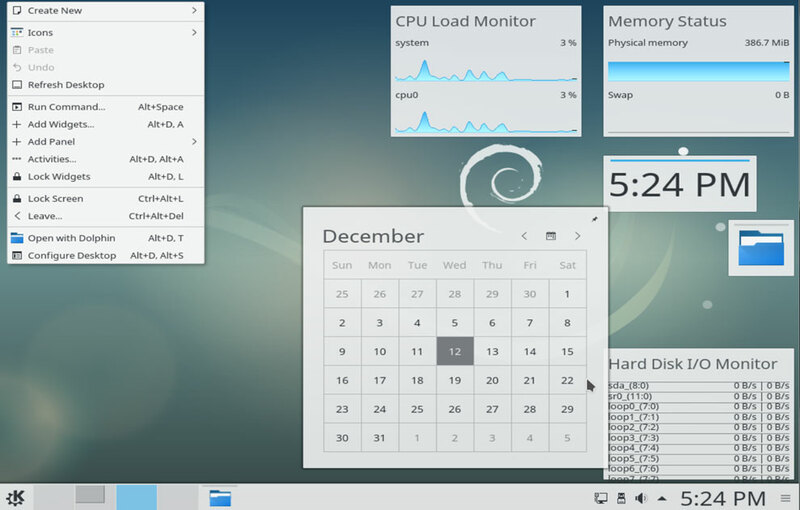 Still, Q4OS levels that playing field by letting you use your desktop choice without undermining the unique system tools and customization opportunities the distro provides. You will not find the Trinity desktop shipping as an option with most Linux distros. Those that use Trinity include Devuan, Sparky Linux, Exe GNU/Linux, ALT Linux, PCLinuxOS, Slax and Ubuntu Nightly. TDE’s growth with Q4OS makes the combination a viable alternative to meet individual and small business computing needs. The TDE 14 series has been in development for more than two years. This extended development period has allowed the creation of a better and more stable feature-rich desktop environment than found in previous TDE releases. Whether you adopt Q4OS to replace a Microsoft Windows experience or another Linux distribution, you will not have much of a learning curve. Out of the box, this distro works well with the default configurations. Its simplified interface is intuitive. Whether you are a holdover from Windows XP or Windows 7 or even a disgruntled Window 10 refugee, Q4OS offers an inviting look and feel. The basic collection of software barely gives you enough applications to get started. You will not find any bloat. Installed titles include Google Chrome, Konqueror, KWrite text editor and a few system tools. From there, what you want to use is easily available through the software center and the Synaptic Package Manager (after you install it). The Desktop Profiler lets you select which desktop environment to use. 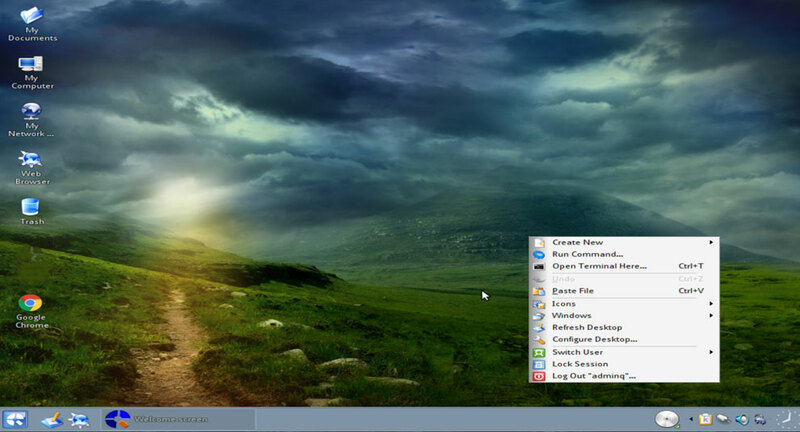 It also lets you select among a full-featured desktop, a basic desktop or a minimal desktop. Install Applications installs the Synaptic Package Manager. Install Proprietary Codecs installs all the necessary media codecs for playing audio and video. Turn On Desktop Effects makes it easy to activate more eye candy without having to wade through more detailed Control Panel options. Switch to Kickoff Start Menu switches from the default Bourbon menu to either Classic or Kickoff styles. It is easy to try each one. Set Autologin allows you to set login to bypass requiring your password upon boot. A nice touch is the variety of background images and the right-click menu anywhere on the desktop.